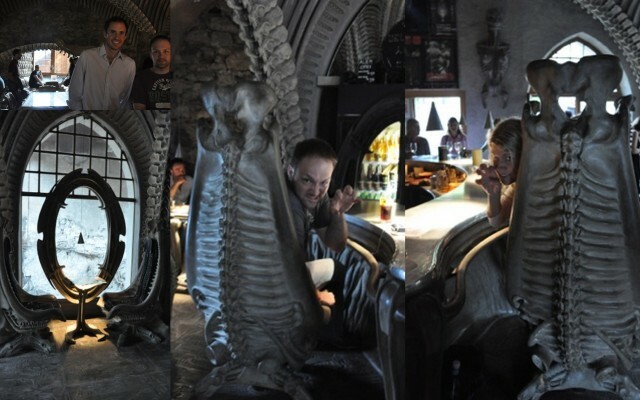 Before we left Gruyeres, Andreas suggested we stop into a bar he had seen on our walk in, the HR Giger Museum Bar. Now from the title, you may think, how scary can a museum bar be? Well, Giger was known for his creative work on Alien and won an Oscar. Apparently this bar was inspired by Jonah being in the belly of the whale. Check out the creativity…..the whole place was a magnificent work of art. I love the one of Andreas and I doing a “double dragon”…our scariest move, from behind our skeletal stools. This entry was posted in Daytrips from Geneva, Food, Wine & Beer, Tours, Museums & Exhibits, Travel: Within Switzerland, Visits & Trips with Visitors. Bookmark the permalink.